The word "עָרֹב" appears in only three places in Tanakh: Shemot 8:16-28, Tehillim 78:45, and Tehillim 105:31. As all three chapters speak of the same plague that was visited upon the Egyptians, the word is a virtual hapax legomenon making it difficult to determine its meaning. Sending of the Plague – Rashi, R"Y Bekhor Shor, and R. Avraham Maimonides note that the פיעל and הפעיל forms of the verb שלח which appear in the dispatching of the "עָרֹב", are found also in Vayikra 26:22 and Devarim 32:24 with regard to wild beasts. Effects of the Plague – While the Torah does not explicitly record that the "עָרֹב" caused the fatalities that would be expected from predatory animals, the Seikhel Tov and R"Y Bekhor Shor explain that this is the meaning of "תִּשָּׁחֵת הָאָרֶץ"‎.10 Shadal adds that the description in Tehillim 78:45 of the "עָרֹב" devouring the Egyptians ("וַיֹּאכְלֵם") fits their identification as carnivorous animals.11 Ralbag, though, proposes that the "עָרֹב" were wolves and jackals which preyed only on livestock. 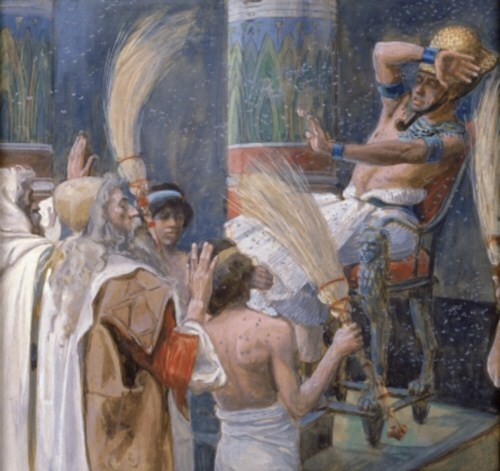 Measure for measure – The different Midrashim give an assortment of explanations as to how wild animals were a fitting punishment for the Egyptians. This is in line with their general understanding of the character of the Plagues – see Purpose of the Plagues for more. Meaning and derivation – The Ma'asei Hashem proposes that "עָרֹב" is a mixture of various types of snakes and scorpions. Sending of the Plague – The פיעל form of the verb שלח, used to describe the dispatching of the "עָרֹב" in Tehillim 78:45, is found also in Bemidbar 21:6, Devarim 32:24, and Yirmeyahu 8:17 with regard to vipers. Nature of the miracle – Snakes are indigenous to Egypt, and the "עָרֹב" could thus fit easily within the category of a natural disaster. See The Plagues – Natural or Supernatural for further discussion of the nature of the Plagues. Derivation – Shadal suggests that "עָרֹב" refers to a mixture of flies and is connected to the word ערבוב (a mixture). Sending of the Plague – Forms of the verb שלח are found also in relation to the sending of the צרעה (understood by many to be a fly, hornet or bird) in Shemot 23:28 and Devarim 7:20. Effects of the Plague – Shadal explains that the language of devouring ("וַיֹּאכְלֵם") found in Tehillim is simply a figure of speech,19 and the verse is just implying that the "עָרֹב" stung the Egyptians. Philo, though, speaks of dog-flies who leech "blood and flesh." Pairs of Plagues – In Tehillim 105:31, "עָרֹב" is paired with lice, suggesting that both are plagues of insects. Cassuto similarly links them, as he divides the entire set of plagues into five doublets. For more, see Structure of the Plagues. Purpose of the Plagues – Philo asserts that Hashem desired "to admonish the Egyptians than to destroy them," and thus He initially sent smaller nuisances rather than larger and more destructive plagues. See Purpose of the Plagues. Yeshayahu 7:18 describes an attacking "זְבוּב" which comes from the Nile River. Based on this verse, it is possible that biting flies were endemic to Egypt. Derivation – This approach might relate "עָרֹב" to עורב, a crow or raven. Sending of the Plague – See above that the verb שלח is found by the צרעה which may also be a bird of prey. Effects of the Plague – If "עָרֹב" refers to birds of prey, Tehillim's depiction of them devouring ("וַיֹּאכְלֵם") is befitting. 1 Some exegetes combine the different possibilities – see Midrash Tehillim and Shemot Rabbah 11:2. 2 Yalkut Shimoni adds snakes to the mix. The same Midrash is cited by the Tzeror HaMorShemot 1:21About R. Avraham Saba in the name of Midrash Yelammedenu. For the source for snakes, see the discussion of Rashi and Seforno in the footnote below and the analysis of the Ma'asei Hashem's position. 3 R. Saadia translates similarly in Tehillim 78:45 and Tehillim 105:31. 4 Like Midrash Yelammedenu and Yalkut Shimoni above, Rashi adds snakes and scorpions to the list included in "עָרֹב" (as does Abarbanel). His motivation may be to explain how the "עָרֹב" filled also the "אֲדָמָה" (earth). This is explicit in Seforno'sShemot 8:17About R. Ovadyah Seforno commentary and in the Ma'asei Hashem, but see the Lekach Tov and Ibn Ezra who explains that "אֲדָמָה" comes simply to include uninhabited areas. 5 This is the position of Ibn Ezra in his Long Commentary. In his Short Commentary, however, he suggests that the "עָרֹב" is a "מין בהמה דקה" which would be a smaller and tamer animal. 6 Ralbag limits the scope of the animals included in "עָרֹב" to wolves and jackals which generally prey on livestock but not on humans. 7 The word would thus be a short form for ערבוב חיות (a mixture of wild animals). 8 See also R. Hirsch. 10 See R. Saadia Tehillim 78:45 who similarly renders "צְפַרְדֵּעַ" as crocodiles because the verse there speaks of "וּצְפַרְדֵּעַ וַתַּשְׁחִיתֵם", but cf. Shadal below who reads this as a figure of speech. 11 See also Ibn Ezra Long Commentary Shemot 5:3. However, see below that Shadal rejects this possibility and suggests an alternative option. 12 However, this argument depends on the identification of the "צְפַרְדֵּעַ" as frogs. If the "צְפַרְדֵּעַ" were crocodiles (see צפרדע), the distinction between these two plagues would be left unexplained. 13 R. Avraham b. HaRambam lived in Egypt for his entire life. 14 According to some of the approaches below (as well as Rashi and others above who include snakes which are abundant in Egypt), the "עָרֹב" fits better within the category of a natural disaster. 15 This may also be Seforno'sShemot 8:17About R. Ovadyah Seforno position. Alternatively, though, Seforno maintains like Rashi and the Yalkut Shimoni above that "עָרֹב" includes wild beasts as well as snakes. 16 See above, though, that others maintain that this is in fact what "תִּשָּׁחֵת הָאָרֶץ" means. 17 For a summary of the arguments for this position, see Gary Rendsburg, "Beasts or Bugs," Bible Review 19 (2003): 19-23. 18 See צפרדע for R. Eliezer Ashkenazi's similar argument regarding the identification of the "צְפַרְדֵּעַ". Cf. Divrei HaYamim LeMoshe Rabbeinu which describes how Hashem sent a special creature through the windows to open the doors of the homes so that the larger beasts could then enter. 19 It is noteworthy that the Torah does not record any deaths resulting from the "עָרֹב". If "עָרֹב" were wild animals or snakes, one would have expected both human and livestock fatalities (like those described in other plagues). 20 Regarding this notion in general and regarding the Plagues, see also Bereshit Rabbah 10:7, Shemot Rabbah Vaera 10:1.